Early morning wake up at 00.am! We climb to the summit of Mount Semeru Trekking (3,676 M) via Arcopodo (2900 mtr asl) and Cemoro Tunggal (3200 mtr asl). Reach the crater’s rim in 4 hours walking, will watch sunrise if we arrive early. In the crater’s rim we could take some photograph and some rest, then descend down to Kalimati base camp (2700 mtr asl) for breakfast. It only takes 1 – 1,5 hours walk from the peak to Kalimati base camp. 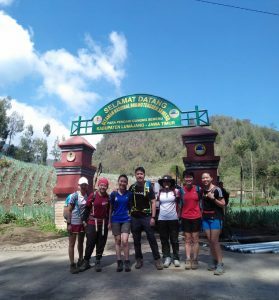 After breakfast, we trek back to Ranukumbolo around 2 – 3 hours for rest and small lunch, here you’ll enjoy the beauty of surrounding’s nature and continue to ranupanee to get jeep driving to cemorolawang stay overnight at Mount Bromo Hotel area. At 3 am the 4 WD will bring you to the world most famous view point at Mt. Pananjakan on the rim of the Tengger caldera to see sunrise with its young volcanic including Mt. Bromo and an active Mt. Semeru in the back ground is breathtaking the play light shadow with sunrise reach Mountain succession from the top to the bottom and the usual fog of the caldera. Afterward the adventure be continued to an active Mt. Bromo volcano to visit crater until it is finished. The 4 WD will bring you to the Savannah until finished then driving back to the lodge for breakfast, showering, packing, loading bags to the vehicle. At 9 am we drive trough scenic landscapes until we reach Ijen plateau where the spend the night in the middle of caldera and world famous coffee plantation in a comfortable and charming hotel Arabica or Catimoer (build by the Dutch colonialist as the head quarter of the coffee plantation around the century ago). Before dinner in the old colonial style dinning room, a hot bath nearby natural hot springs will be unforgettable relaxing experience. After dinner a briefing about the following excursion to Item volcano will be given. At 1.00 am, we will start driving a short way to the pal tuding and then start trekking 3km about 2 hours to get the summit and walking down to the blue acid lake the search and get the spectaculer of blue fire. After That, we leave Ijen plateau and drive to Surabaya Airport duration about 7h and Surabaya Mount Semeru Bromo Ijen 5D4N is ended.